A look at past and present funding for U.S. science, in both domestic and international contexts. Federal R&D investments are the backbone of U.S. science and technology, but navigating the subject can be tricky. This newly updated brief helps readers better understand the complex and evolving science funding landscape – both at home and abroad – in recent decades. Excerpts from the brief are published below. For more, download the full report. Virtually all federal R&D funding is contained within the discretionary budget, the portion of federal outlays determined annually through the appropriations process. 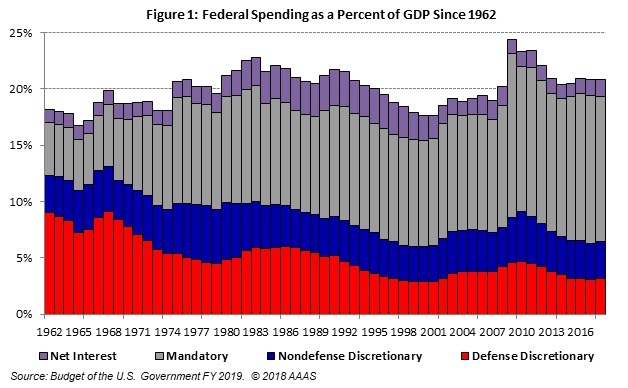 As seen in Figure 1, discretionary spending –especially defense – once occupied a more prominent place in the budget. Over time, however, the budget has come to be dominated by mandatory spending, made up mostly of the major entitlement programs – Social Security, Medicare, and Medicaid – and mostly on autopilot. This is driven by an aging population, rising healthcare costs, and other factors. This matters for science because R&D doesn’t tend to change much as a share of the discretionary budget. At the height of the Space Race, R&D comprised 17.4 percent of discretionary spending, as seen in Figure 2. 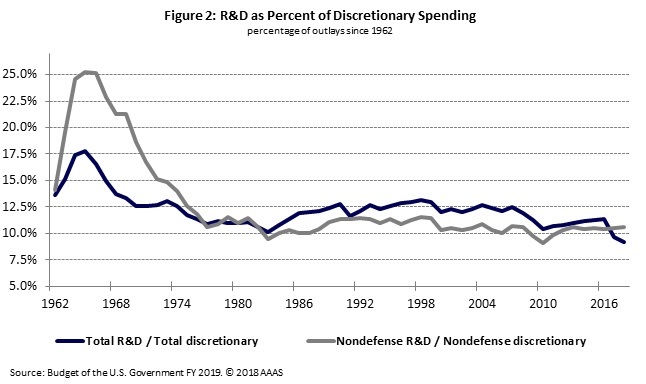 But since the early 1980s, R&D has tended to fluctuate between 11 and 13 percent of discretionary spending (recent changes in what gets counted as R&D have pushed this share somewhat lower). In many years, as the discretionary budget goes, so goes the R&D budget. The centrality of discretionary spending for science can be seen in spending changes by agency (Figure 3). Beginning in FY 2011, the base discretionary budget began coming down, first for nondefense and then defense as well. The spending caps established by the Budget Control Act of 2011, including sequestration in FY 2013, intensified the strain. 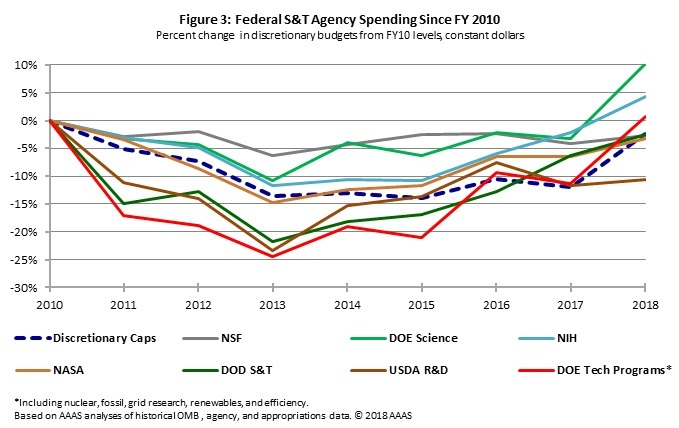 The impact on science agency budgets is plain in Figure 3, with budgets moving in rough unison depending on what is happening with the broader discretionary budget. This has historically been the case, though Congressional Budget Office (CBO) predicts discretionary spending will continue to decline relative to the federal budget and the economy overall as mandatory spending continues its growth. [i] This suggests federal R&D activities may also continue to decline relative to other economic activity, even as federal R&D dollars grow in absolute terms. Turning next to basic research specifically – as opposed to total R&D – spending among OECD member countries has quadrupled since 1985. The U.S. barely cracks the top ten in basic research as a share of GDP, though total American basic research spending remains largest in the world by far. The U.S. and other advanced nations have historically placed a high emphasis on basic research as a key to competitiveness, and some emerging competitors have accordingly assigned a high priority to basic research. For example, South Korea recently announced plans to double its basic research budget by 2022. [vi] But this is not the case everywhere. For instance, in spite of its recent rise, China has tended to invest relatively less in basic research and more on applied research and development. In fact, basic research accounted for only 5 percent of Chinese R&D in 2015, compared to the OECD average of 17.2 percent that year. Within government research portfolios, US spending on health R&D remains the highest among OECD nations in both absolute and relative terms (see Figure 18). Additionally, the U.S. devotes the largest share of R&D funding for defense purposes, at roughly 50 percent of the federal portfolio in 2016, whereas the European Union set aside only 4.2 percent. However, the fraction of US government research funding for agriculture and energy and environment is nearly the lowest among all OECD countries. 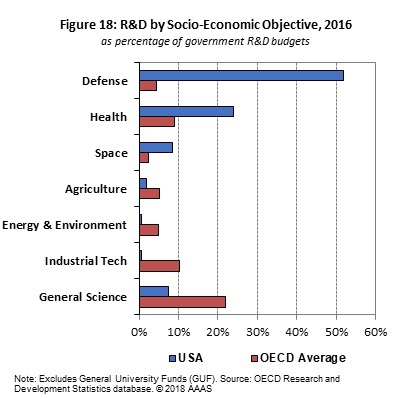 The U.S. also assigns just a tiny fraction of its R&D budget for industrial technology, including R&D for innovative manufacturing processes. The general science function – core basic research that cannot be attributed to a specific objective – ranks surprisingly low in the U.S. compared to most OECD countries. On average, one-third of R&D in OECD countries is for multi-purpose general university funds (GUF), government block grants used at the discretion of higher education institutions; the U.S. does not employ a GUF mechanism.